The U.S. Department of Labor released statistics Friday showing that the overall unemployment rate inched up slightly to 6.2 percent in July from 6.1 percent in June. And unemployment in the African American community remain in the double digits, causing alarm among some civil rights leaders. Last month, the black unemployment rate was 11.4 percent, up a few points from the previous month, the Department of Labor reports. The good news is that the numbers are down from 13.5 percent about the same time last year. Meanhwile, the unemployment rate for whites in July was 5.3 percent and 7.8 percent for Hispanics, showing little or no change, the report says. Dedrick Asante-Muhammad, senior director of NAACP's economic department, said the unemployment rate among minorities must be addressed. 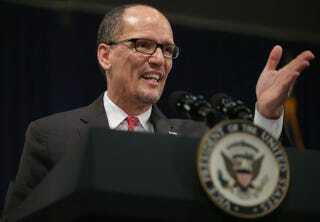 Meanwhile, U.S. Secretary of Labor Thomas E. Perez released a statement Friday touting overall job growth. Perez said the overall unemployment rate was 6.2 percent, a slight increase from the previous month that was largely due to an increase in labor force participation. The overall unemployment rate was down significantly from 7.3 percent in July 2013, he said in the statement.